ATTENTION: The auto-location feature is ONLY available for the Android and iOS applications. The Auto-location feature for Android and iOS provides continous location data in order to improve planning accuracy and transparency. Note: The Google Maps services embedded in our products are not allowed to be used in the following countries and regions: Crimea, Cuba, Iran, Myanmar, North Korea, Sudan, Syria, Vietnam. First, you will need to enable the Tracking.Enabled company setting in the Admin module. If not using the default settings, you can set the Time Threshold and Meter Displacement settings. After the relevant companysetting has been enable, you will then need to grant permission from the application itself. The following settings are managed at Admin > Company > Settings. The Location.Tracking.Enabled setting enables the application request the user’s current location when the default or specified time and distance thresholds are met. This helps to enable tracking of technician’s location to be able to see the current location of a technician in a report or on a map. This setting does not affect the location being sent with user actions like person status or workflow step change. For these changes the location will be sent always independent of this setting as long as the application has access to the location. TRUE To enable the feature to actively track the user’s location and send it to the Cloud. The Location.Tracking.TimeThresholdInMinutes setting allows you to define a duration in minutes that represents the time threshold, which, once exceeded, will trigger a request for the user’s current location. This helps to define the frequency for tracking the technician’s location depending on time change. For example, if the value is set to 10, then a new location is requested at least every 10 minutes. It may happen more frequently, if another setting (such as the displacement in meters) triggers a location update first. The Location.Tracking.MinDisplacementInMeters setting allows you to define a distance in meters that represents the distance threshold, which, once exceeded, will trigger a request for the user’s current location. This helps to define the frequency for tracking the technician’s location depending on the location change. For example. if the value is set to 1000, then a new location is requested at least every 1km. It may happen more frequently, if another metric (such as the time threshold) triggers a location update first. 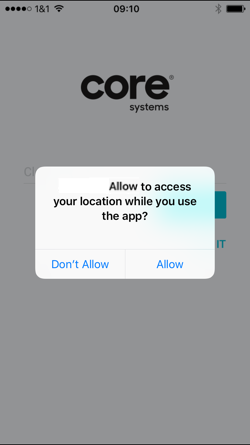 After the relevant company setting/s have been enabled and configured, you will then be able to provide tracking information by giving consent when prompted by the application. The location information can only be sent if the user allows the application to access the location in the application settings.